The diet drug Alli prevents a portion of the fat a person consumes from being absorbed. Washington (CNN) -- Counterfeit capsules of the diet drug Alli that are sold online can pose a serious health risk to some users, a research director from the Food and Drug Administration said Saturday. The FDA warned consumers this week that fake versions of the over-the-counter drug are being sold, mainly on online auction sites. Testing shows that the counterfeit pills contain excessive amounts of sibutramine, a prescription drug and controlled substance that can place people with cardiovascular disease at risk for higher blood pressure, heart attack or stroke, said Janet Woodcock, director of the FDA Center for Drug Evaluation and Research. The fake pills contain at least twice as much sibutramine as would normally be recommended, she said. "Unfortunately, many people with high blood pressure or heart disease are trying to improve their health by losing weight, and we are concerned that such individuals might be exposed to the counterfeit drug," Woodcock said. Woodcock said possible symptoms of excess sibutramine are heart palpitations, sleeplessness, anxiety, dry mouth, nausea and shakiness. She said the FDA has received about two dozen calls from people reporting these symptoms. According to Alli's Web site, sibutramine is the active ingredient in the prescription diet drug Meridia. "Sibutramine could potentially interact with other medications the consumer may be taking, and there are dosing differences between Alli (three times a day) and Meridia (once a day)," the site says. 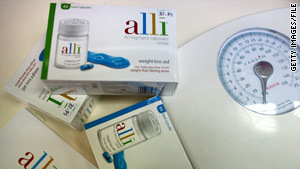 Analysis also shows that the counterfeit pills lack the active ingredient orlistat found in the authentic Alli product, which prevents a portion of the fat eaten from being absorbed, Alli's Web site says. Instead, the fat passes directly through the digestive system and is eliminated. • LOT code information is missing from the top of the box. • The expiration date includes month, day and year (example: 06162010), instead of only the month and year (example: 05/12). • The seal on the bottle should read "SEALED FOR YOUR PROTECTION" in white ink on the real Alli bottle; this statement is not present on the fake product. • The counterfeit capsule is slightly larger, and its content is powdery; the genuine capsule is shaped more like a pellet.